Richard Dawkins silent concerning ‘Evolution vs God’? On August 6th 2013, YouTube channel ‘The way of the Master’ published the new film ‘Evolution vs God’. This film challenges the popular theory of Darwinian evolution, primarily the theory of ‘Macroevolution’. This film has now received 775,695 views on YouTube. According to the reports, the New Zealand born evangelist Ray Comfort has not yet received any direct response from Atheist activist and Darwinian evolutionist, Richard Dawkins. The apparent silence has come despite repeated offers for an open response. In the film, Ray Comfort interviews and asks a number of leading evolutionary scientists in America for direct evidence for ‘Macroevolution’. Outside of claims based upon speculative ideas and theories, no evidence could be given. Perhaps the only main responses Darwinians and atheist activists have offered are a number of criticisms published on YouTube, which are for the most part little more than ‘ad homimen’ posts and re-affirmations of ‘Macraevolution’ with no direct evidence for ‘Macroevolution’. Perhaps this noisey silence tells us a great deal about the true condition of the theory of evolution and Richard Dawkins? The first being that there is a number of ways defeat can be seen, even without words. One way of responding to someone who you consider stronger than yourself is to say nothing, and merely go one doing as you did before. Clearly Richard Dawkins is doing that. Perhaps Darwin’s time is up and maybe it is time for truck loads of Evangelical Christians in England to purchase copies of ‘Evolution vs God’ and spread them across the UK, at the University of Manchester, Cambridge, Oxford, Scotland, Exeter and so forth. Perhaps even give free copies out to the Liberal bishops within the Church of England? That would be good wouldn’t it. Maybe even David Cameron could receive a copy too? 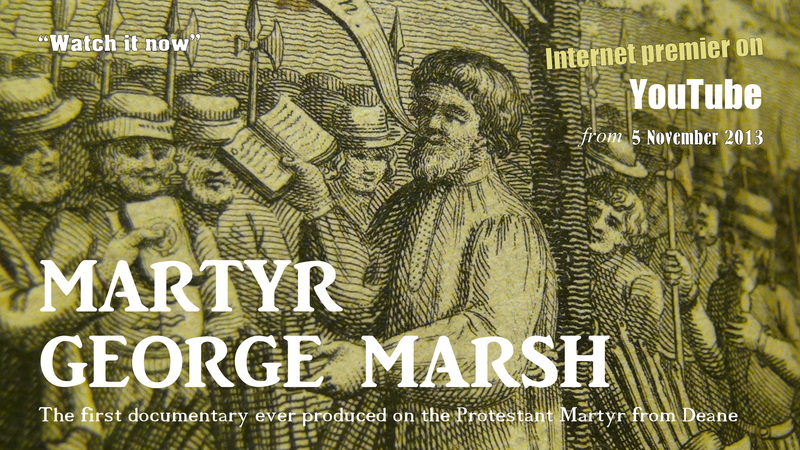 “Martyr George Marsh” A new documentary on Protestant preacher and martyr, George Marsh. Direct from the maker of “The Apostles at Paphos” is a powerful and touching story in many ways and is a story that England should ‘never forget’. Starting in the year 1515 from the birthplace of George Marsh at Deane, Bolton in Lancashire, moving towards the later death of his wife and Marsh’s time studying Theology at Cambridge and working as a minister in London and Lincoln, the story moves towards the death of Protestant King Edward V1 in 1553 and the ascending of the Roman Catholic Mary 1 to the throne and her persecution of protestants that followed. The story tells how George Marsh returned to Lancashire to preach and see his family, where his presence caught the attention of the authorities and a charge was put out by the Earl of Derby, of Lathom House to Master Barton of Smithills hall, Bolton, to find George Marsh and charge him to appear trial before the Earl and his council. Marsh handed himself in at Smithills and was charged to appear before the Earl of Derby and he stood trial at Lathom House and was imprisoned at Lathom and was afterwards sent to Lancaster Castle where he was imprisoned for several months before being taken to Chester where he stood trial yet again and was condemned to death. He was burned alive at the stake on April 24th 1555 by order of the Bishop of Chester, Dr Cotes. 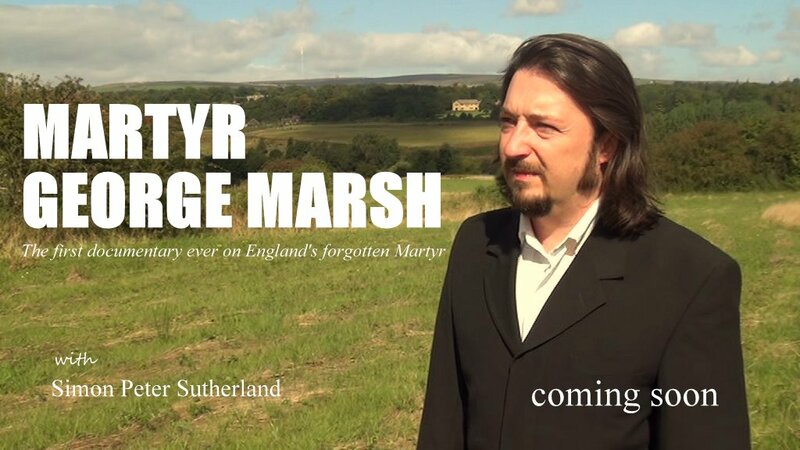 Two years in the making, the documentary ‘Martyr George Marsh’ has a unique structure and feel. The film is written, produced, directed and presented by Theologian (B.Th, Th.M) and Singer/Songwriter Simon Peter Sutherland (stage name: Shimeon). 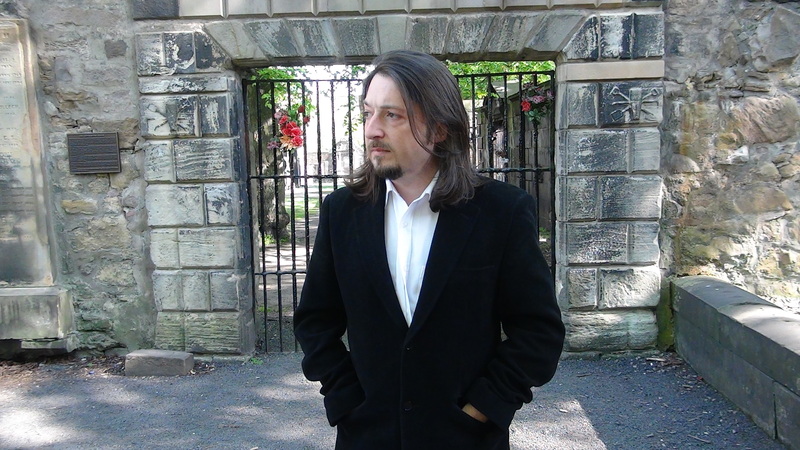 Following the theme, Simon Peter begins his research at Chetham’s Library, Manchester and tells the story of George Marsh from historic sites at Deane, Deane Parish Church, Deane Clough, Smithills Hall, Lathom, Ormskirk Parish Church, Lancaster Castle and Chester Cathedral, the Northgate and Gallows hill. The documentary bases its proof text upon the earliest account of George Marsh from the grand narrative contained in the earliest 16th century prints of “Acts and Monuments” (The Foxe’s book of Martyrs) by John Foxe. The oldest known narrative of the George Marsh story and an account published using the actual text of George Marsh himself. The research for the film has been done at and from the archives of Chetham’s Library, John Rylands Library and Bolton Central Library. Simon Peter Sutherland has also composed and produced the soundtrack for the documentary and has also provided some traditional hymns as a backdrop. In conclusion, Simon Peter Sutherland has produced a fine and well researched documentary, which in a time where many are concerned for the future of England, Simon draws upon the past, that a nation may never forget their own history, lest they find themselves condemned to repeat it. The documentary is none profit and its release will include a free internet distribution. I was recently in a second hand, part antique, part book shop in North Wales. An old Welsh Bible with crumbling binding and unbound leaves was amongst the books. I took the Bible, purchased it and looked for points of interest within it. The Bible dates from 1857, so it is not that ancient. 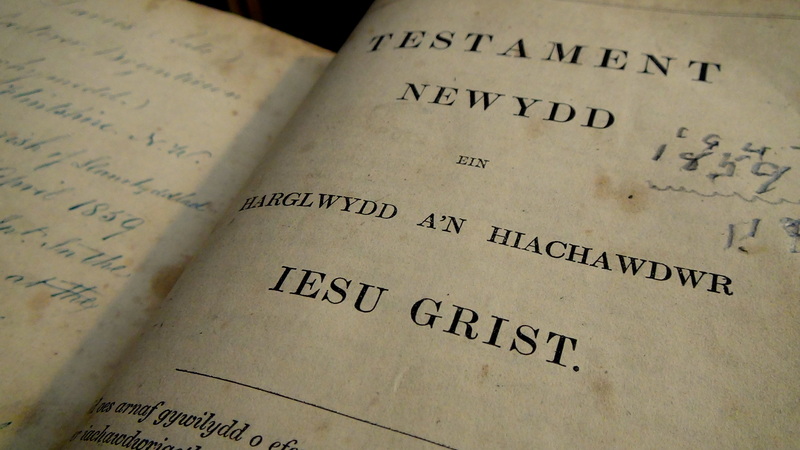 It was published, as most 19th century Welsh bibles are in “Llundain”. It is likely to be a print of the 1620 revision of ‘William Morgan’s’ translation, and from the notes an inscription inside, it appears to have been owned by a 19th century preacher. 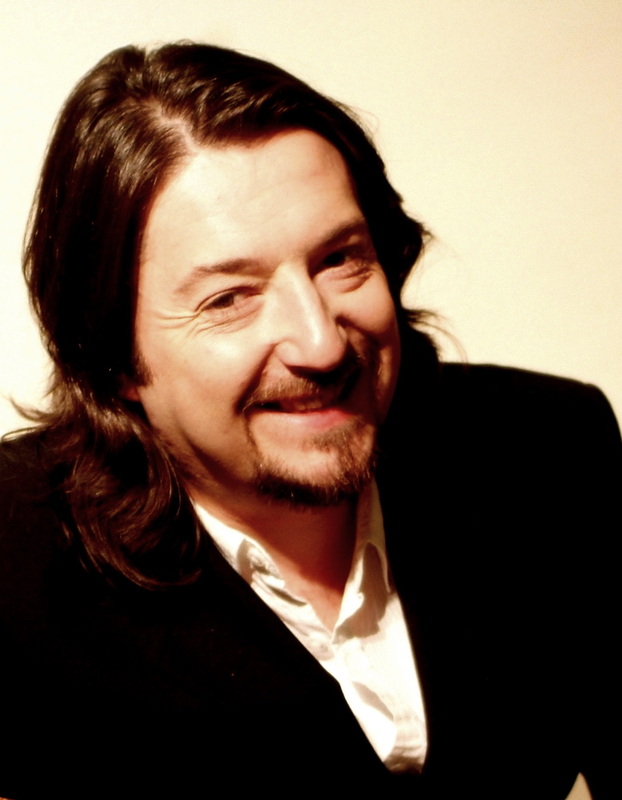 His name was “John Davies”. From the handwritten inscription written on a blank page between the Old and New Testaments, it appears that Mr Davies lived on Anglesey in the village of “Llannerchymedd” in the 19th century. Back in those days, the village was home to a busy market, perhaps Anglesey’s most popular. The handwritten tribute in this Welsh Bible says Mr Davies was a “manufacturer” so perhaps he continued his trade in Llannerchymedd. 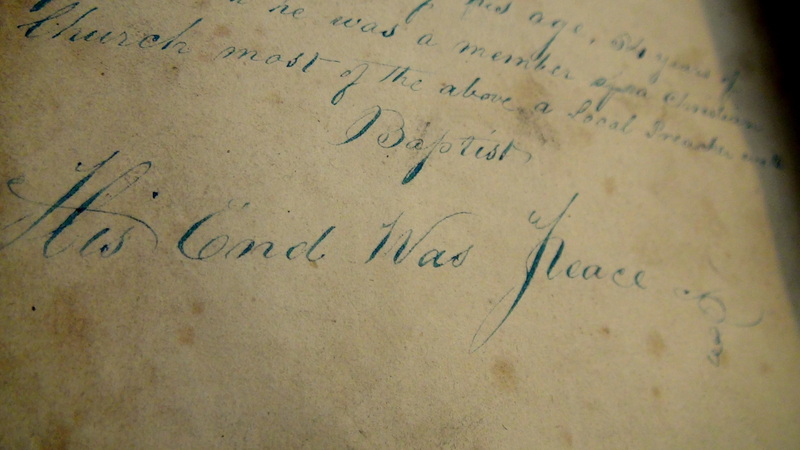 The handwritten notes pay tribute to Mr John Davies and says that he was from “Flintshire” in North Wales and died “the 4th day of April 1859”. This was the same year of the shipwreck of the “Royal Charter” at Moelfre, where I purchased the book. The writer says he died “in the 73 years of his age” of which 34 years of his life had been spent a member of a Christian church and was “a local preacher with Baptists”. The text says “his end was peace”. So I have written these thoughts on him and hope on my part that it offers just a tiny tribute to a man whom, like so many, time has forgotten. I would have liked to have visited his grave this time and to have taken that Bible with me, but time forbid me such. So maybe in the future, should I return, I hope to visit his resting place and lay some mark of respect on his grave, a flower or something. It is the least I can do.